Help Center: How can I save a student report to PDF? 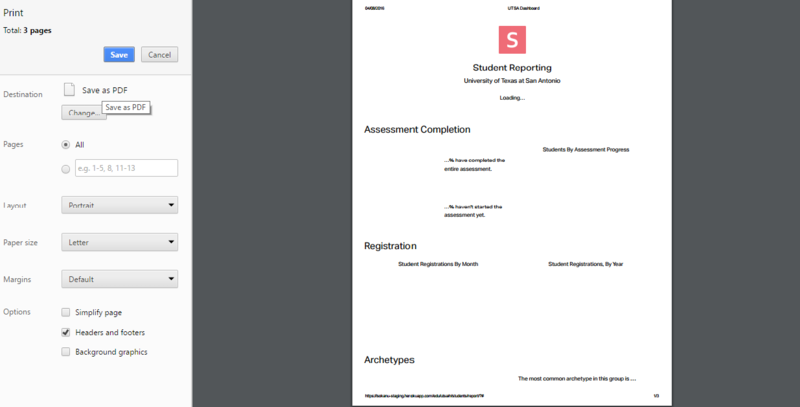 How can I save a student report to PDF? From your "Student Directory" page, click on "Generate Detailed Report" under where it says "Student Body Insights". From your detailed report view, you'll notice a "Print" button on the top right-hand corner of your screen. When you click "Print", a window should pop up. In your print window, you will see a section called "Destination". Under "Destination" select "Save as PDF" (see screenshot, below). How can I send a group email to my students? Can I take the assessment again? How do I reset my answers? What do I do if my student is not showing up on my dashboard?